Give that boy a Chocolate Fish! 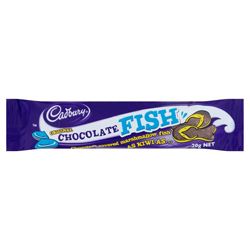 The Cadbury’s Chocolate Fish is a soft strawberry marshmallow shaped like a fish, covered in rich dark chocolate. Chocolate Fish have been part of kiwi culture for many years. Sugar, Glucose Syrup, Cocoa Mass, Invert Sugar, Gelatine, Cocoa Butter, Milk Solids, Emulsifiers (Soy Lecithin, E476), Colour (E120), Flavours, Cornstarch. Love them!! a light treat but indulgent. Lovely light marshmallow with delicious Cadburys chocolate on the outside - yum! How happy was I to find chocolate fish on the website? One bite and I'm transported back to my NZ childhood. There's nothing in the UK like them - and yes, the choc does taste different (dare I say, better). No better combo than marshmallow and Kiwi Cadbury's chocolate - thank goodness, you do the Easter eggs as well! I often tell people, "New Zealand sweets fall into two categories. So hard they'll crack fillings, and random marshmallow"
These are the latter and such a major part of kiwi culture we even have a saying "Give that man a chocolate fish!" My (English) husband is hooked after I bought a few for him to try. Every time the boxes of 49 come up I have to buy him one. There's something about the soft marshmallow center and that thin shell of chocolate that just makes these so morish. Careful though, before you know it you've eaten half the box! I'm so glad I've found THE SOURCE!! The idea of eating chocolate fish just about brings tears to my husbands eyes! My 9 year old son has had them in NZ and is hooked, and I love them.